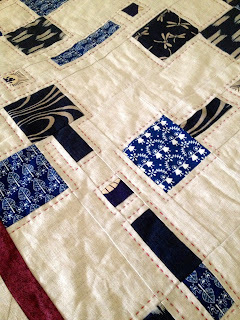 I am getting on with the Linen Quilt, about half done with the echo quilting around the indigo prints. I decided to do big stitch quilting in cosmos red embroidery thread. I am very pleased so far, I think it is looking good. I am not sure what to do on the borders yet. Linen and Indigo quilt with red quilting. The six shirts quilt was also duly quilted and finished. :0) Crosshatched over the nine patches and stitched in the ditch on the borders. 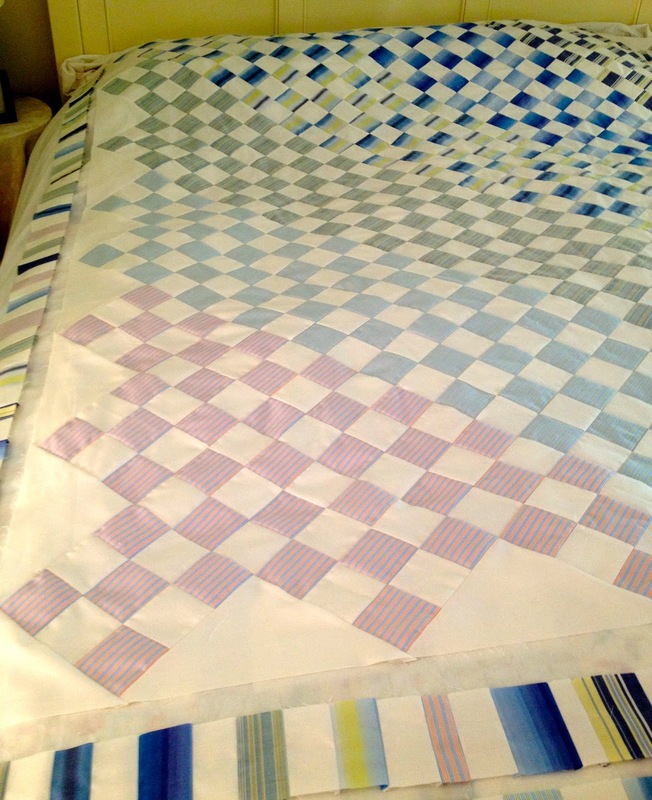 It was duly slept under as the recipients made a visit last week end, and it is now ready to be shipped to Key West. 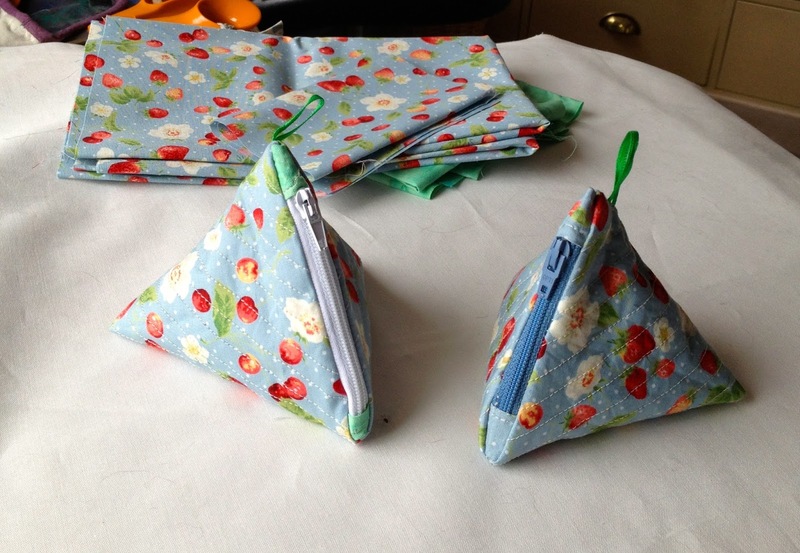 I did just go off on a tiny tangent, (well I was being so good) and I saw this tutorial on Twitter, and I wanted to fire up my new sewing machine. So I made a couple of these little coin purses, are they not the cutest little coin purses ever. It was the Bee this week and I thought I must show you Alison's BOM that she is following on this blog, I just love the colours she is using. I have been given a new Nike fitness band, so I have to go for a walk now to up my steps, or I shall be all behind for today. 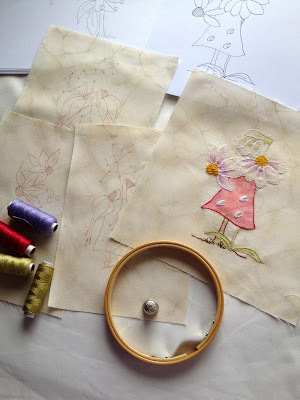 Keep safe and keep stitching..... Doti.. It is indeed back to plan A to finish my UFO's this year. 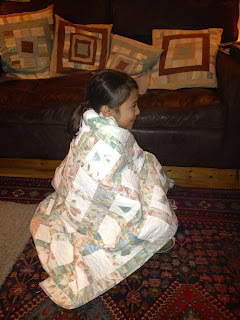 I keep all my quilts, including the ones ready to quilt on the spare bed, and as we had visitors coming they all had to be taken off and stored away . 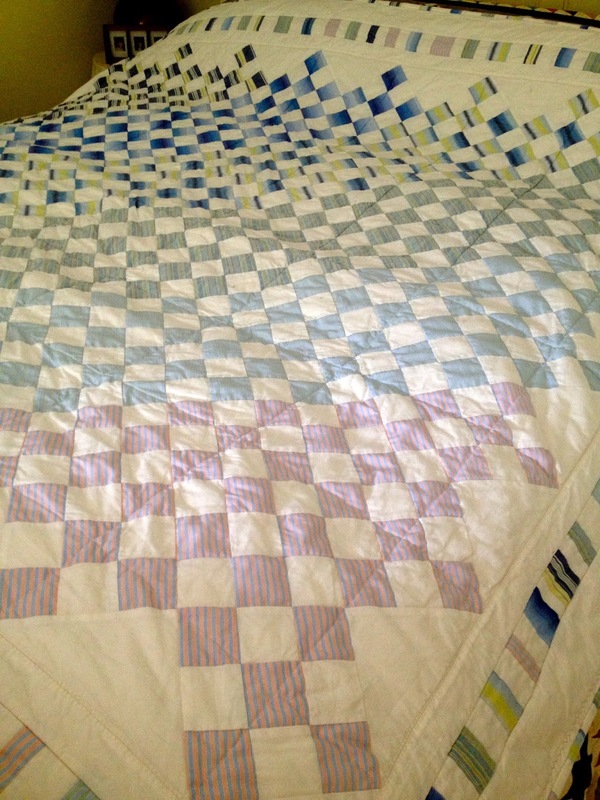 My husband offered to help, "bad move" as he spied a quilt I started making for him some two years ago, all basted and pinned and ready to go.. You know the rest without me telling you. 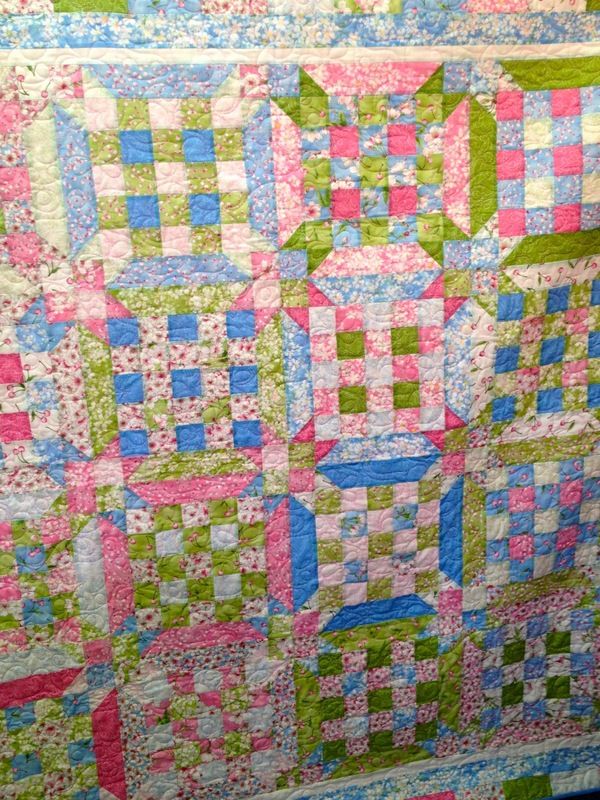 No more playing with little toadstools, got to finish his quilt. 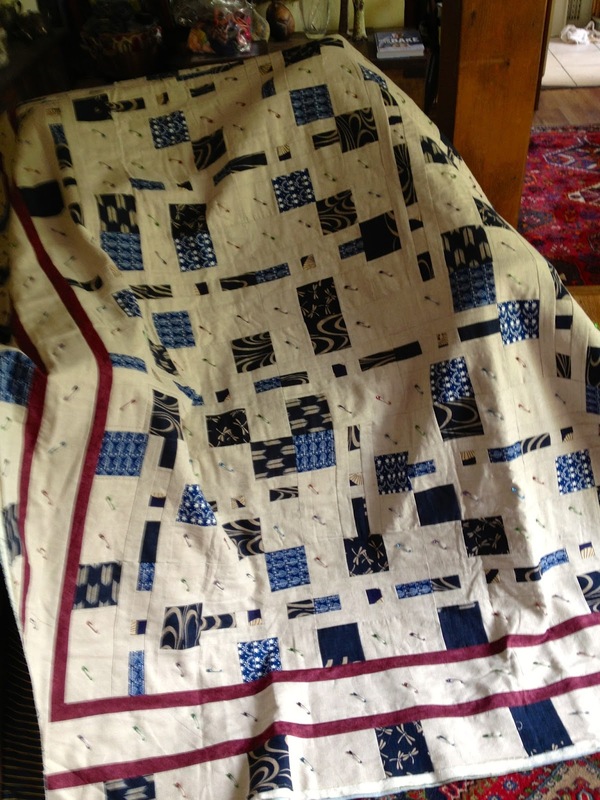 Essex Linen with Japanese fabric Quilt. I was very surprised to see how much the blocks resembled the confetti block that I had made recently for Siblings together charity quilt, although this pattern came from Patternspot.com and I can't even find it now. 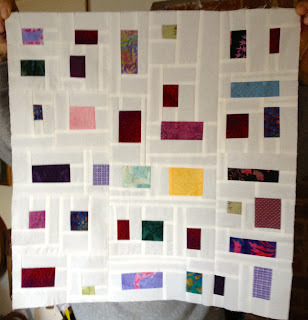 I intend to echo quilt around the indigo blocks in red/maroon so watch this space. 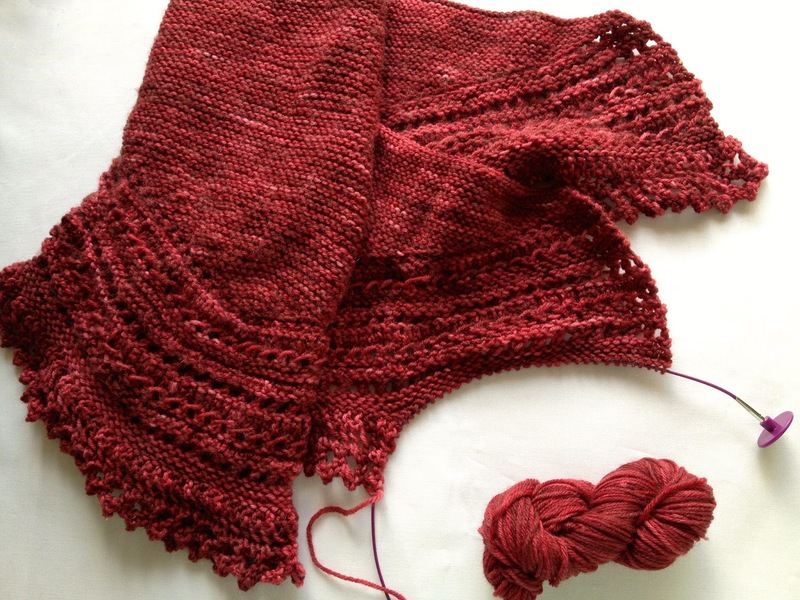 My friend Anj from Meadow Yarns came up trumps with 15grams of the exact wool I needed to finish my little shawl, which was great so that will be one Christmas prezzie done. 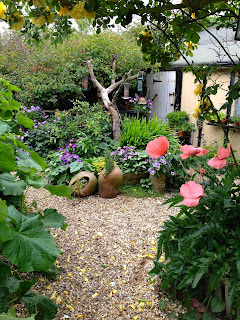 My goodness, this has not been a good summer, but things are looking up in the garden at last. We always come in the back gate and I am now loving this view that greets you. 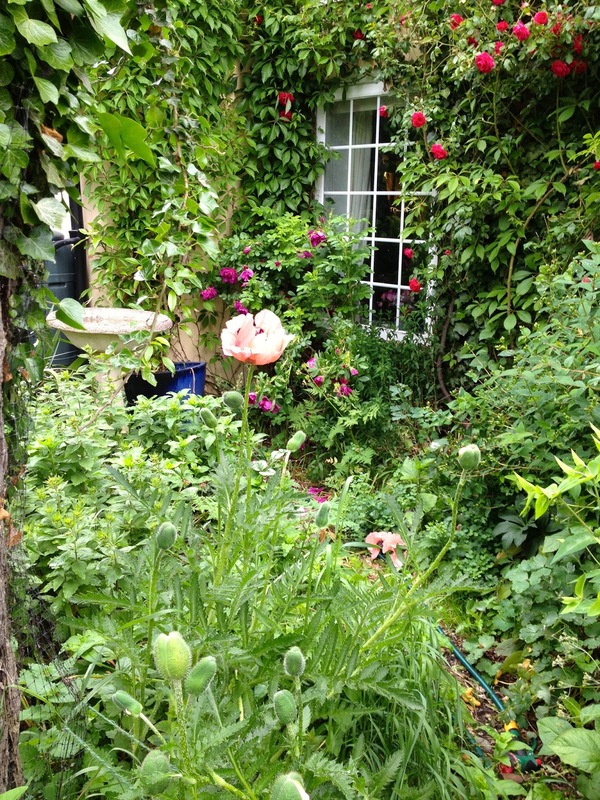 Although I might have to get in the front garden and do a do a spot of tidying up, don't you think? Going to finish the shawl first and then start on the Linen quilt. I have been told by one of my best buddies that I do not go off at a tangent but I am merely multi- tasking. Oh! I do feel so much better now. I always feel a little guilty when I start a new project and I have not finished the last one, sometimes leaving them never to return. 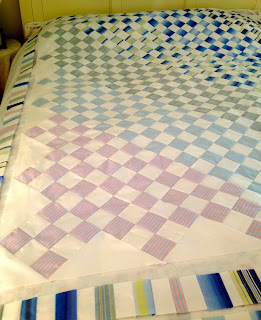 Not so the Six Shirt Quilt before you ask, it is in the tumble dryer as I type this.. 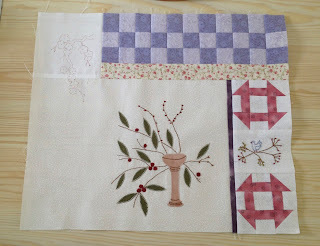 I am so loving this new project I am working on, but I fear it may end up as another wall hanging. Although I did get one suggestion via Facebook to make a bag, but I think she was pulling my leg as she knows how many bags I have made. Can a girl have too many bags I ask? It was Wednesday club again yesterday, so I was working on my little mushroom project. Ann and Maggie were working on their BOM's and it was great for me to see what they are doing with my designs, I am kind of liking theirs more than mine now, but it's too late to change my colour scheme. I love their bright colours, Ann is working in Batiks, and Maggie lovely autumn colours. I do wonder if some of you who are reading my blog are sewing along with us, I would love to see what you are doing..
Now this is my disaster for the week, just 20 more rows of this little edging to do and I have run out of wool. I was making this little shawl to replace the one I had already made as a present, and decided I liked it so much that I wore it. This evening I am at "Stitch and Sip" and my friend Anj from Meadow Yarns has said she may be able to help, keep your fingers crossed for me.. It's true, I have gone off at a tangent again, but I am having fun so what the heck. The first six things on my to do list are all done, so I am having a break. 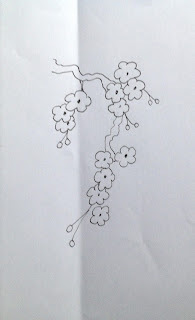 Playing with colouring my stitchery. 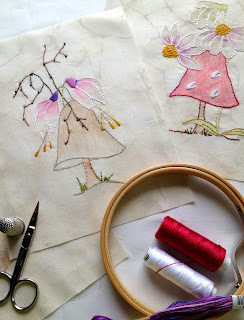 I started with some little mushroom and flower drawings, transferred them to some fabric, but they looked a little bland. My friend Ann suggested I coloured them, as I had done on a Meg Hawkey Quilt of Crab Apple Hill Studio that I had made (all stitchery done but not finished). It is on the to do list but a long way down, Ha! I am liking them a lot better now, but not sure where I am going with this. Any suggestions please? This weekend is a lot quieter then the last. My youngest grandchildren came to stay, and Molly was given her scrappy heart quilt as it was her birthday. They were here for the National Dry ski Championships, They both did very well but Molly looked so weeny coming down that great big slope. Wish I had though to tidy the cushions on the sofa before taking this photo. 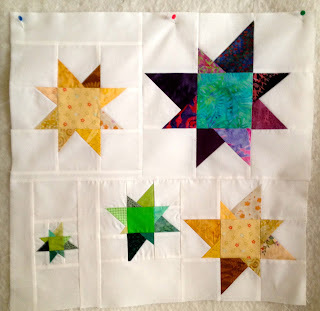 The first Block, "Wonky Stars," for the Siblings Together Bee 2 has been duly posted to the Mama for June, and the Mama for July (who's just had a baby) requested the "Confetti " block and put it up early. So I have just finished making that, and am well ahead at the moment and quite pleased with my self. 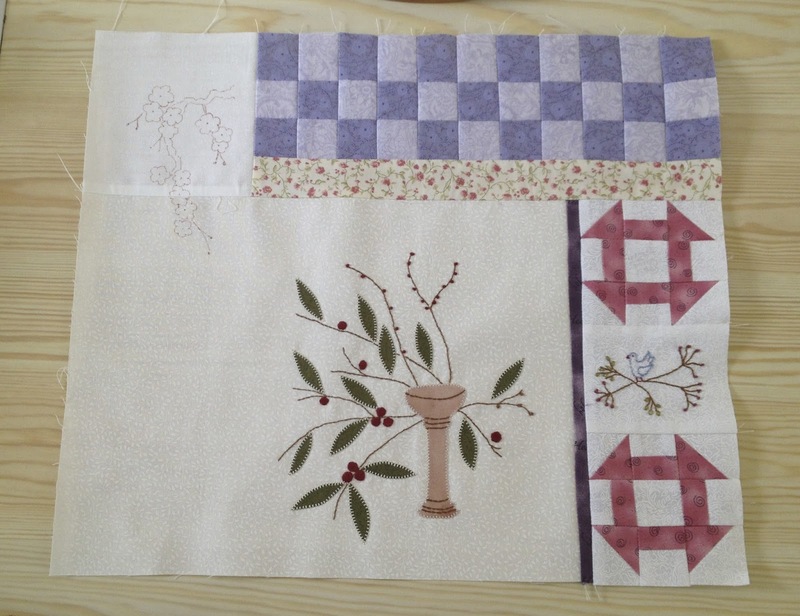 This quilting Bee is a great learning curve for me as the Blocks are HUGE 20" square. I had always fancied making a full size quilt from Confetti blocks, but I have learnt something while making this big block. Perhaps I won't, very fiddly.. I have had a very busy time and I am sorry that I am late with this months mystery BOM pattern, though I did say on or around the 12th of the month. This month it is piecing with a little stitchery thrown in. Cut 16 1 1/2” squares in light fabric of your choice. Stitch in the colours of your choice. Block 3 finished, and should now look like this. I do hope you are enjoying making this wall hanging. Some of the "girls" at the Bee yesterday had brought their blocks to show me, they were great and such a diverse colour range. I wish I had taken photos. Oops! I forgot to put the stitchery drawing in.. It was more like a Knitting Bee yesterday than a Sewing Bee as several of us were knitting up the little hats for Age Concern Suffolk.We have now knitted 93, a bit down on last year when we knitted over 200, but we do have till the end of July so who knows. 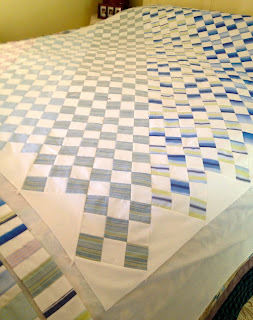 I told you about the on line quilting bee in my last post. Well, I finished June's Block, and now have to post it off. Goodness me that was well out of my comfort zone. The block had to be 20" and that is a big block for me.. I have loads more to write about, but I want to go play with my new sewing machine !! At the moment, it is scaring the wits out of me. Watch this space. This is all new hi- tech for me. I even had to join Flickr. WOW.. Its called Siblings together Bee 2. Siblings Together is a charity for siblings that don't live together to have a holiday. 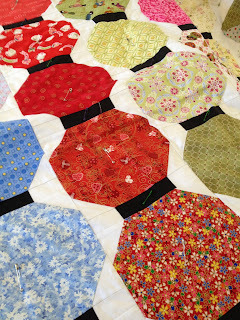 Groups of 12 Quilters get together to make 12 quilts in the year. You make one block a month and send it to a nominated Mama and she puts the quilt together for that month. My month is January 2014 so at the moment I only have to make one block, and this month it is Wonky Stars. I will tell you more about this later, as I am the last recruit and have never done anything like this before, so still feeling my way. Thank you Teresa over at Hilly Filly for twisting my arm, it is a very worthwhile cause. Yesterday was a fun day at Wednesday Club, which as you know is held at Quilters Haven. 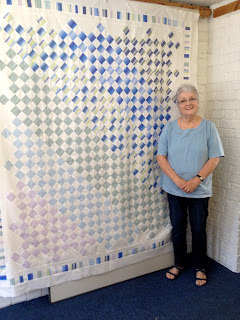 I hung my Six Shirt Quilt up on the design wall there, to photograph it, and spent the rest of the day making the scrappy binding, chatting and having fun. 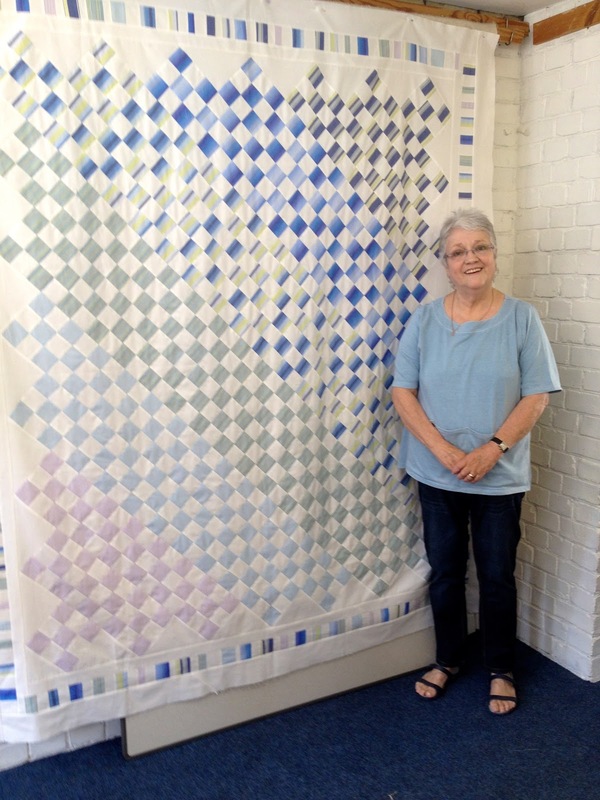 Six Shirts Quilt and Me. All the "girls " were working on different projects, or had brought things to show and tell. 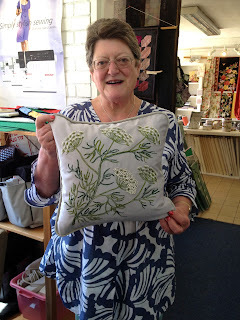 Fiona with her beautiful cushion she had been working on at the Bee, now finished! The detail in the hand embroidery is wonderful to see, and as you know I love Cow Parsley or the prettier named Queen Anne's lace. Fiona had bought the kit to make this cushion 20 years ago so well done to her for finishing it. 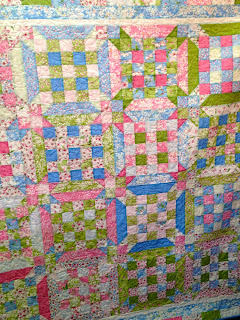 Ann had just basted her Lantern quilt and was in the process of hand quilting it.She did not want to be in the picture so have had to crop her out. She uses such lovely bright colours. Alison was binding her lovely quilt (and also would not be in the picture) and each block in her quilt was different. I love seeing all the things my friends make, they are all so talented. 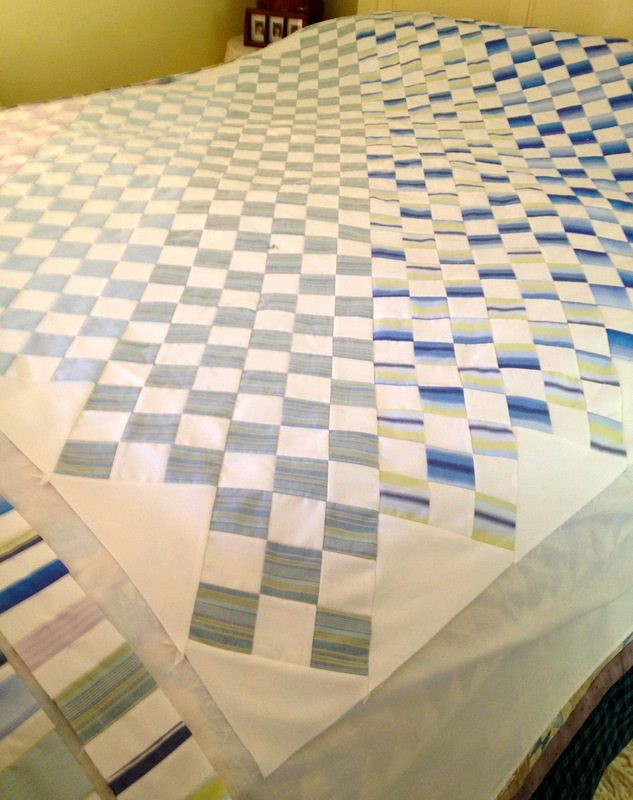 Things are progressing with the Six Shirts Quilt and I think it is looking really good, and I am well pleased with the progress so far. It is still residing on the spare room bed, as it's a little too big for the design wall. All the blocks are now sewn together on point, ( there is a free app on iPhone called QuiltRef that tells you the sizes of triangles) and I am now working on the borders.There were a lot of scraps left so I'm now in the process of making piano keys as the second border. The intention is to add three borders. At the Bee this week, I finished the stitchery on block seven. Now to write the instructions and this is the bit I hate. 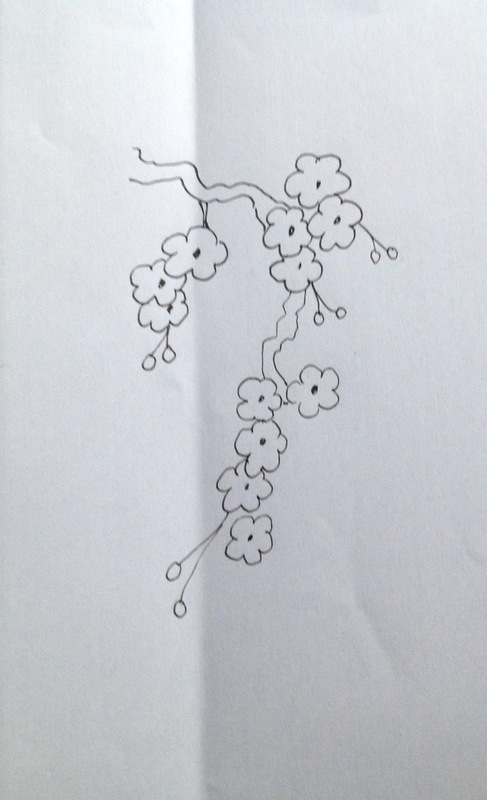 I could draw all day and stitch all day but the instructions come hard to me. One of the girls brought her first two blocks in to show me. It was lovely to see, and her colour combination was lovely. Jenny was knitting her hats for smoothy bottles. We knit them each year for Suffolk age UK and last year we knitted over 200. We are a little slow off the mark this year and as Jenny had put me to shame I set too and made these last night. 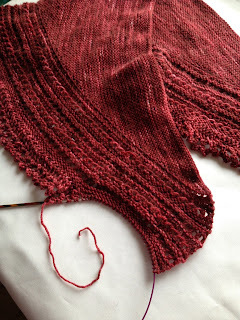 I tend only to knit in 4ply so will have to get some more DK wool. 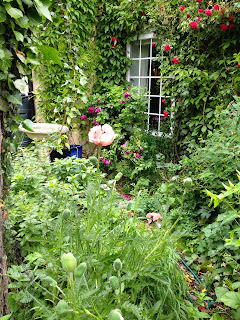 Back to making my borders now as the sun has gone in so no more gardening today.